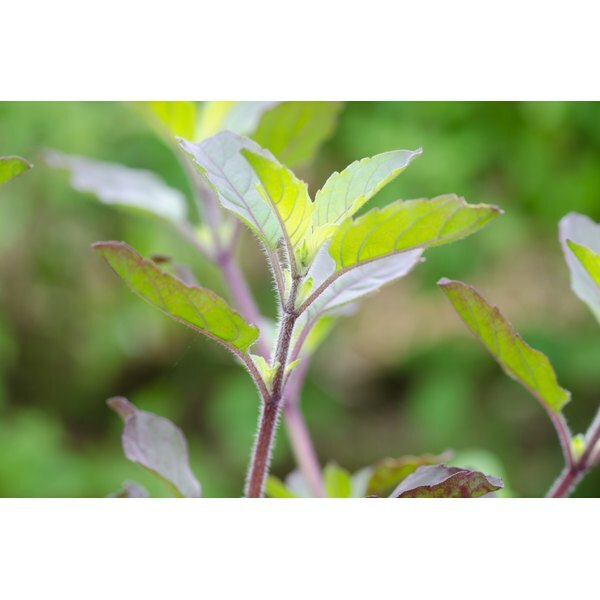 Holy basil, also known as tulsi, is an Indian herb known for its therapeutic effects on conditions such as arthritis, digestive problems, stress and depression. As a dietary supplement, holy basil is typically taken in dried, powdered leaf form once or several times daily. Though herbal remedies are a time-honored approach to enhanced wellness, they may pose risks and side effects. A doctor&#039;s guidance is suggested before use of holy basil. Holy basil may be used as a treatment aid for depression. According to the book, "Herbal Treatment of Children: Western and Ayurvedic Perspectives," by Anne McIntyre, due to the effect holy basil has on the nervous system, it may work to reduce symptoms of mild depression, including depressive moods, anxiety, sleep problems and stress-related problems. Holy basil may also be used to reduce depression related to other conditions, such as bulimia nervosa and anxiety disorders. Holy basil dosage varies, depending upon a person&#039;s size, age and health. According to the University of Michigan Health System, standard dosage generally involves 1,000 to 2,500mg of dried, powdered holy basil leaves per day. Doses may be taken once daily or divided into smaller amounts throughout the day. Though holy basil is still being examined for potential risks and side effects, some negative side effects have been reported. According to the University of Michigan Health System, use of holy basil has been linked to fertility problems. No drug interactions are known as of yet. While proponents of holy basil claim that it can effectively reduce stress and manage symptoms of mild depression, additional studies are needed. According to natural health expert Dr. Andrew Weil, research has been limited to animal studies. Potential effectiveness and safety issues regarding human use remain unknown. A report published by the California Naturopathic Doctors Association in 2007 describes holy basil as an effective means of reducing the stress hormone cortisol in people experiencing cancer and associated depression. Since the effects of holy basil on major depression remain unknown, its use is not recommended for individuals with severe depression or other psychological disorders. Weil suggests alternate means of relaxation and stress relief, such as breathing exercises and physical activity, until more is known regarding the safety and effectiveness of the herb. People interested in taking holy basil supplements should seek a doctor&#039;s approval and guidance. Serious symptoms of depression may require prompt medical or psychological treatment.